Private sessions are the ideal way to jumpstart your recovery process. Initially you and your instructor will meet behind closed doors in a fully private equipment room to review any notes from your physician or physical therapist, assess your condition, and begin planning the best course of treatment for you. 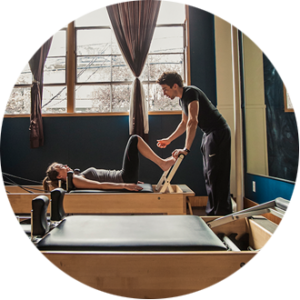 You will be given a postural assessment, if necessary, and your instructor will gently guide you through a series of Pilates exercises, noting your areas of strength and weakness, flexibility, and range of motion with careful, hands on guidance to make corrections and ensure proper alignment. Throughout your session your instructor may also test muscles to see if they are firing in the proper sequence. After your first session, he/she will make notes in your folder for you next session and to document your progress. For maximum benefit and improvement, we recommend coming in for privates a minimum of two times per week. Did you know that your health insurance may cover your private Pilates sessions? Check with your health care provider to see if you need a referral. While we cannot bill insurance directly, we can easily provide them with your progress notes, copies of receipts and your visit history. You may also be able to use your Flexible Spending Account toward your privates.